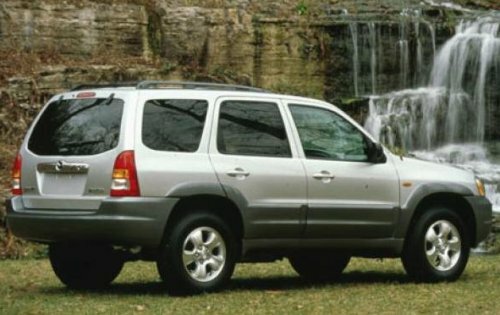 The National Highway Traffic Safety Administration and Mazda have announced a recall of the 2001 and 2002 Mazda Tribute compact sport utility vehicle over a concern that the brake fluid reservoir on the master cylinder could leak – leading to corrosion of essential braking system components and possibly causing a fire in the worst case situations. Earlier this month, the NHTSA and Ford Motor Company announced a recall of over 244,000 Ford Escape sport utility vehicles over a concern that the master cylinder reservoir could leak and cause an engine bay fire and with the Mazda Tribute being essentially the same vehicle under the sheet metal – it comes as no surprise that the Japanese automaker is also recalling their compact SUV for the same reason. This recall affects 52,390 Mazda Tribute SUVs built between April 20th, 2000 and July 19th, 2002 and the recall relates to the same master cylinder reservoir cap that caused the earlier Ford Escape recall. In these vehicles, the master cylinder reservoir cap can leak over time and should this occur, the brake fluid can drip onto the electrical wiring harness that controls the antilock braking system. Brake fluid is incredibly corrosive so if left unattended, the leaking brake fluid can eat through the protective coating on the ABS wiring harness which could lead to a malfunction of the ABS system. Even worse, if the problem is left unattended for long enough, the protective coating could be melted away and with the presence of the flammable brake fluid as a fuel and the unprotected wires as an ignition source – this problem could lead to smoke from the engine bay and eventually, an engine bay fire. As is the case with the Ford Escape recall, Mazda will ask owners of the 52,390 Tribute SUVs to return to their local dealership where the master cylinder reservoir cap will be replaced and the ABS electrical wiring harness will be “modified” – although no details have been offered as to how they will modify the wiring harness. It will presumably come in the lines of an extra layer of protection, just in case the master cylinder should leak any brake fluid down into the wiring harness area. This new Mazda Tribute recall is expected to begin immediately but until the owners have been contacted and repairs have been made, Mazda suggests that owners park their vehicles outside to prevent any indoor fires from occurring as a result of the possible brake fluid leak. For more information, owners can contact Mazda at 1-248-393-5990 in reference to recall number 6712A. I have a 98 gmc savana van. I discovered you have to mount the gasket onto the master cylinder cover first before apply. I had been loseing fluid and now have brake fluid all over the truck brain. Wireing. One of chevys better ideas.